“I wanted to capture the musk-like smell of skin, using all naturals, which was quite a challenge,” Mandy Aftel writes of her latest fragrance, Aftelier Memento Mori. At first blush, creating a perfume that smells like skin might seem pointless. After all, aren’t we wearing skin? We should have skin smell already built in. Think about it a moment, though, and it makes sense. Maybe you look out your window at a mountain, but it doesn’t take away from the pleasure of viewing Cezanne’s Mont Sainte Victoire. An artist’s interpretion of her subject adds value. Even an exact depiction of something can be art, because the painting is not the original object — ceci n’est pas une pipe. In the case of Memento Mori, this is not skin. It’s perfume. And now that I am in art theory way over my head, I’ll say that to me Memento Mori is not a headspace-like reproduction of skin’s scent. Rather, it might be Francis Bacon’s take on skin for its first several hours, fading to the dried rose petals and maternal flesh of a Mary Cassatt. Butter, orris and beta-ionone with their skin-like flat but subtly floral aroma was the perfect entry into the perfume. Phyenylacetic acid combines the animalic with the floral. The rose notes are a soft and intimate bridge to the skin-like tones of the wood violet — beta ionone — and the rich but transparent patchouli isolate — patchoulyl acetate. The luminescent texture of ambreine, civet and ambergris lends warm and sheer notes of musk that linger. On me, Memento Mori goes on sharp and slightly fusty, like parmesan cheese brushed with acid. It’s disturbing and not particularly pleasant, but interesting. Over the next half hour, the fragrance seems to incrementally relax, showing a floral heart so gentle that it might simply be the breath of cotton wool stored in a chest with a decade-old wedding bouquet. The fragrance loses some of its metallic fustiness, too, but its queer, acidic skeleton shows its bones for several hours. Finally, hours in, Memento Mori transforms into a velvet whiff of barely sweet, warm, intimate notes, like smelling the inside of a winter overcoat in the summer. It’s gentle and easy to wear. This is the phase of the perfume I like best. I sampled Memento Mori in Parfum, and it has amazing staying power. A drop shared on two wrists, applied before breakfast, still goes strong by dinner. It is completely nongendered. If you like fragrances that are “pretty,” you might not want to go to a lot of effort to sample Memento Mori. But if you enjoy perfume that aims more toward art than easy pleasure — like, say, Byredo M/Mink — do give this one a try. Aftelier Memento Mori is available in 30 ml Eau de Parfum ($180), or in 2 ml mini Parfum ($50), 1/4 oz Parfum ($180). Samples are also sold. 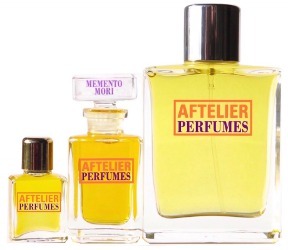 For information on where to buy Memento Mori, see Aftelier under Perfume Houses. Note: top image Renaissance Gimmel Ring with Memento Mori (German, 1631) via The Met. “Francis Bacon’s take on skin” is, frankly, terrifying. I’d love to know if you agree, if you ever get the chance to sniff it! Maybe I’m having a queer reaction. It is a little scary! But intriguing, too. The link is to the 16th C philosopher Francis Bacon, but Angela, I assume you meant the Irish/British 20 C painter. His art is definitely not Love’s Baby Soft skin! Closer to acid, infection and pain. Dang it! I thought I’d linked to the right Bacon. Yes, I definitely mean the 20th century painter. I just saw the London Calling exhibit at the Getty here in LA, which featured several Francis Bacon paintings. After spending time with the painting “in the flesh” and a recent Momento Mori sample, I actually think the connection of the perfume to Bacon’s painted skin is even more apt. At first look/smell, there is something off-putting and challenging about both, but upon deeper analysis, their is an overwhelming tenderness and intimacy. Bacon painted people he loved, and Aftel’s fragrance wafts with adoration too, ultimately. I apologize for the cringe-inducing typos above, the sin of there/their especially! That is a beautiful description! Thank you so much. Now I’ll think of it when I smell the fragrance. You lost me at “fusty.” Not something I want to smell like. Ever. Not even for a second. Money saved! ???? Money saved is always good for me these day. An aside–for a moment I thought your avatar was a three-eyed owl! and yes, I am grateful for you not creating a deep want as you so often do because I am desperately trying not to spend any more money….God knows I have enough perfume to last me years and years! Why not put that money toward more care packages? You have some very lucky friends! I worry that I’m scaring people away from it! If you like Aftelier’s work, it’s worth trying. It could be that I’m reading it all wrong or “going into it” the wrong way somehow. Hi Angela . I think you have made this sound very interesting and I would try it but it’s not available here. In character it sounds a bit like Lush’s All Good Things…also musk and a bit woodsy and a mood of neglected or faded scents. Eleebelle, I saw your comment below, and I think you may be on to something! I’ve been so remiss about Lush. I really need to try more from that line. Okay, I confess, “anything from that line” is more accurate. “like parmesan cheese brushed with acid”…….yikes ???? I know! I can’t believe that the fragrance was meant to be that way. I’m starting to think it must be me and my inability to process certain notes. I really hope others who have tried this will chime in. Do try it, though, if you get the chance! Ok, so I’m suspicious and I have a theory. I ordered a sample the day I heard about because it sounded perfect. I ended up really disliking it: it smells like popcorn butter and chemicals on me. Anyway, my theory is that I’m hyper sensitive to one of the floral components, and it’s rendered me basically incapable of smelling anything else. I’d be incredibly interested to hear whether there are people who don’t find this jarring in any way. Oh, I wonder if I’m having the same issue, too! Either that, or I’m not capable of smelling something, so it’s out of balance. Fascinating! Normally, I’m all over the Aftelier line, so I was surprised when the first few hours of this one hit me in an unexpected way. But if my nose can’t sort it out, it would explain it. Did you like SL Jeu de Peaux? That seemed very buttery to me and I wonder how that compares? I liked Jeux de Peau and found it more bread-y than buttery, and I didn’t get the same hit as I do with Memento Mori. Very diplomatic! I will be placing an order for a FB of something and will ask for a free sample of this – I won’t pay for it since I was leery of it even before reading your review. I really would love your opinion on this! Maybe something is wonky with my ability to smell it. I find the concept of creating a skin scent fascinating, and I think I understand where you were going with your art theory which has also gone over my head the more I thought about it. This has been one of those times where the more I thought about what a skin scent is or represents, the more lost I became and then ended up having no comprehension whatsoever. As soon as you mentioned “parmesan cheese brushed with acid” I immediately thought of some of my elderly patients who have that exact smell, and not to get too graphic but anyone who has worked in health care knows certain odors which are associated with illness, aging or medications. I’m not sure what people think of when they think of a skin scent – I don’t even know what I think! There are so many factors involved – culture and geography and food and hygiene, so many things come into play. I’d love to find out what other perfumes people think of when “skin scent” is mentioned or if that remains a concept to most and not a reality. Usually when I hear something called a “skin scent,” I think of a fragrance that blends with a person’s chemistry and feels natural, like an extension of themselves, when it’s on. In the case of Memento Mori, I think the scent is a take on the actual smell of skin. Which, it sounds like, actually might be a little parmesan like! 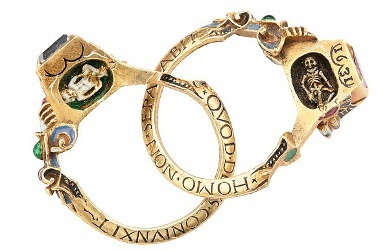 Memento Mori sounds really weird but I WANT that ring! The Met (before it was abbreviated) used to do wonderful reproductions of ancient and antique jewelry, but they’ve seemed less interesting to me in recent years. It’s probably gotten too expensive. The rings truly are fabulous! Google memento moro jewelry, and you’ll find some great stuff. I am so sorry that this was you’re experience with Memento Mori! It sounds like in combination with your skin the perfume yields notes that weren’t there to begin with . . . I knew when I created this perfume that it would smell very different on each person and change over time on their skin. cheese *smell*, of course — I have a very aggressive auto-correct! Mandy, it has to be some combination of my brain, nose, and skin. You’re too skilled to accidentally pull off a cheese note! I’m going to start dabbing my sample on friends to see how it wears on them. I’ve also gotten the parmesan cheese at the top of the scent. It last for only a few minutes but it was damn good parmesan! Not something i want to smell like but it was delish! I’m glad to hear I’m not alone! I was second-guessing myself.